Bottom of Pyramid Energy and Environmental Innovations. Bottom of Pyramid Energy and Environmental Innovations is a Social Venture that develops renewable energy and other technologies for the rural India. We emphasize equality, treat employees, customers and all stakeholders fairly. This venture was inspired by the teachings of Manashakti Center for Peace of Mind, Lonavala and Management Guru Prof C K Prahalad. We work hard to make technology work for the common man in a green manner. Our engineering strategy is driven by the desire to provide products that will last for decades. Given a choice between additional revenues vs. longer lasting products, we choose the later in the interest of humanity and the environment. Located in Pune, BOPEEI is led by highly successful professionals having extensive experience in corporate world. Technology for Equality is the philosophy which drives innovation at BOPEEI. Using technology to solve common man’s energy needs. Flagship Project: BOPEEI Team has developed an electricity generator (Patent Pending) based on Human Power. Called the Chakra Generator ™, the system generates electricity with just 10-12 minutes of easy pedaling by any user. Pedaling effort is designed in a way such that people of ages 9 to 70 year old can generate their own power easily. 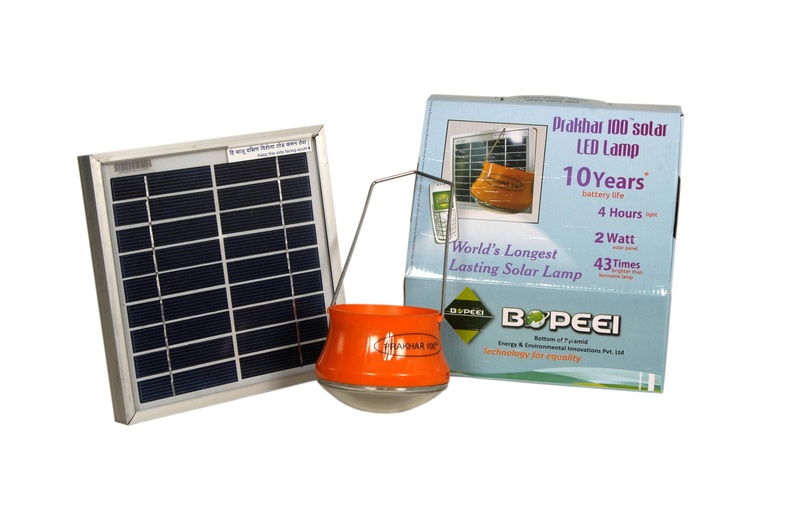 This Power is stored and later used to generate 4-10 hours of bright lights using BoPEEI’s Prakhar ™ series Lamps. For more info click here.